This week we’re continuing our series introducing you to some of the great people who make up the Colligo team. 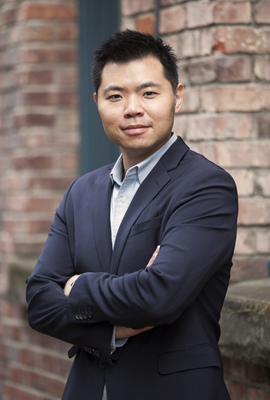 Today we’re talking with Tom Ng, a technical consultant on our pre-sales team. Hi Tom, great to be speaking with you today. You’re one of Colligo’s go-to experts when it comes to business processes, record management, and SharePoint. Can you tell us a little bit about your professional background? Well, I got my degree in math, but I’d had a passion for computers and programming since I was in high school. I was already working as a programmer part time when I graduated university; I learned coding by doing. So I worked as a programmer for about 10 years and then decided I wanted to make a switch to more people-facing role with greater responsibilities. I had an interest in process improvement and project management, so I joined the consulting world and started out as a tech lead. That evolved into release management, project management, and account management. We seem to have a lot of people here who studied math! When did you join Colligo and what enticed you to join? I joined last September, about a year ago. I had heard about Colligo, being in the SharePoint space myself. Being involved in account management I felt getting into pre-sales was a natural move and I wanted to get more involved in the revenue-generating side of the business. A year in, what do you like the most about working here? It’s definitely the people that I work with. And the role itself is diverse. We’re always working to solve challenges and working collaboratively with different teams. I get to do a lot of different things. There’s always activity on new deals like demos and pre-sales work. But also account management, giving input on the product direction, jumping in on marketing initiatives, even helping with partner management and professional services. There’s always something interesting to dive into. It sure sounds like it. What’s been your focus this week? Recently I’ve been spending a lot of time on one of our Colligo’s core areas of expertise: driving high user adoption of our products. Ultimately, that’s what drives business value for our customers. I’ve been doing additional research, and working on the methodologies and processes we use to help customers achieve that high usage. It’s all part of the sales/account management spectrum. We know we need to be results-driven for our customers, and that starts with the strategies they’re trying to drive. So we ask: what are the key metrics we’ll use to align with those goals, what are the benchmarks, and how will we get where we want to be? We map out the processes and resources needed to ensure the customer is successful. The feedback loop is a big part of it too—bring intel back to our team to keep improving the product and drive high value. What advice would you have to someone interested in joining our team? Bring your passion for technology. It would be great if you love SharePoint! I think it would help to be very adaptive. We’re dealing in customer environments where the pace of change is high. There are always new technologies in the workplace. We leverage a lean strategy to help things to happen. I think you also need to be customer-focused to work here. I really like Amazon’s stated goal that they want to be the most customer-centric company in the world. What do you love about SharePoint? (Laughs) I was just thinking the other day… the first version I worked with was in 2007, so it’s been a 10 year relationship. It’s changing a lot. It’s a product that has evolved into a very popular, widely-deployed collaboration platform. It’s very flexible and you can basically implement it 50 different ways, and every customer has their own flavor of how they’re using it. So there’s always something new to learn. We both have young kids, which I know keeps you busy—what do you like to do outside of work? I love travelling with the family; we took a recent trip to Quebec and earlier this year went to Asia. I actually enjoy the trip planning part as much as being there—finding places to see, laying out an itinerary, etc. I’m pretty organized (laughs)—it’s the project manager in me. You’re on the board of VanO365 (formerly the Vancouver SharePoint User Group). How did you get involved? Yeah, we just changed the name to include a broader spectrum of participants, since Microsoft rolled SharePoint into Office 365. I was part of the SharePoint community back in 2010 or so and then put my hand up to join the board when a spot came available. It’s been a great experience actually, especially organizing the monthly meetups and the Vancouver SharePoint Saturdays. I get to know a lot of people in the tech community. There are a lot of people using Office 365 and SharePoint, and I enjoy learning how they’re all solving problems in very different ways. Microsoft’s annual Ignite conference just wrapped up. Anything you’d highlight for our readers to keep an eye on? Microsoft Teams for sure. It’s been the theme of the whole conference. It will be interesting to see how they drive uptake and how it matures into the more collaborative tool Microsoft has in mind. Then in terms of record management, it looks like SharePoint will be supporting event-based retention in the Office 365 Advanced Data Governance framework that allows administrators to create events which will trigger the retention period of data in Office 365. As always, there’s a ton of new stuff to digest coming out of Ignite.